In 1953, while working a hotel switchboard, a college graduate named Shea Zellweger began a journey of wonder and obsession that would eventually lead to the invention of a radically new notation for logic. From a basement in Ohio, guided literally by his dreams and his innate love of pattern, Zellweger developed an extraordinary visual system called the “Logic Alphabet” in which a group of specially designed letter-shapes can be manipulated like puzzles to reveal the geometrical patterns underpinning logic. 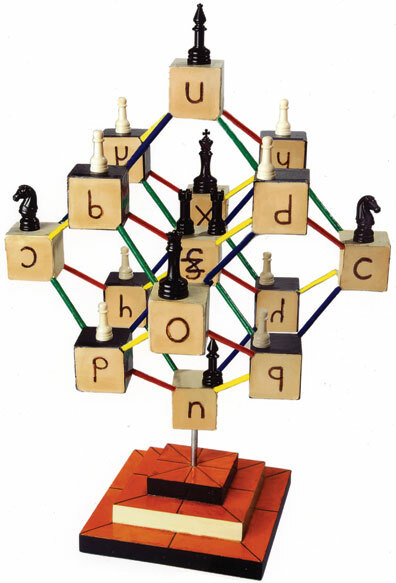 Indeed, Zellweger has built a series of physical models of his alphabet that recall the educational teaching toys, or “gifts,” of Friedrich Froebel, the great nineteenth century founder of the Kindergarten movement. Just as Froebel was deeply influenced by the study of crystal structures, which he believed could serve as the foundation for an entire educational framework, so Zellweger’s Logic Alphabet is based on a crystal-l­ike arrangement of its elements. Thus where the traditional approach to logic is purely abstract, Zellweger’s is geometric, making it amenable to visual play. Like his notation, Zellweger’s working methods are delightfully unconventional. 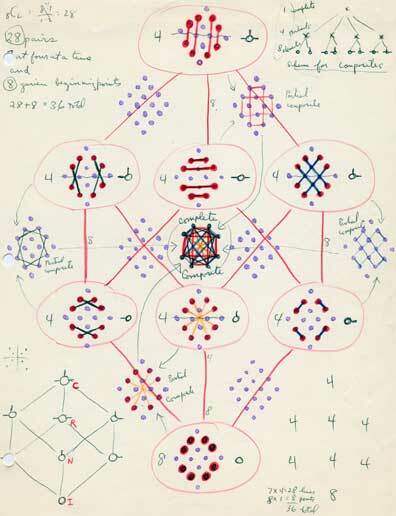 While constituting a genuine research project in logic, his notebooks (made between 1953 and 1975) have remarkable visual appeal, passing through phases reminiscent of Russian Constructivism, outsider art, concrete poetry and pop. These days we accept outsider artists, and are perhaps aware of outsider scientists, but Zellweger may be the first we could define as an outsider logician. Although he has worked on the Logic Alphabet for over fifty years, his professional life has not been spent in departments of philosophy or mathematics, but in psychology, mostly at Mount Union College in Ohio, from which he retired in 1993. After half a century of obscurity, Zellweger’s work is starting to attract the attention of some mathematicians who believe it offers an exciting new perspective on logic.